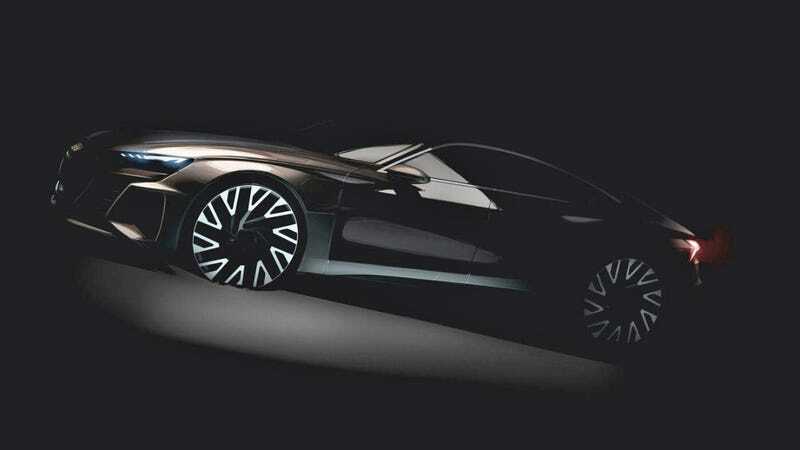 There’s a few new teaser images of the upcoming 2020 Audi E-Tron GT due to be fully revealed at the LA Auto Show this week, which is based on the Porsche Taycan and previews a slightly different German challenger to the Tesla Model S.
Following the reveal of Audi’s electric crossover, which is just called the E-Tron, and the PB18 E-Tron supercar concept, Audi is finally prepared to show off its electric luxury sedan. It used to be those came first, but SUVs rule the world these days. Two new teaser images featuring Audi design boss Marc Lichte popped up on Germany’s Bild, which also teased a range of over 400 kilometers, or roughly 248 miles, from a 100 kWh battery pack laid out in the floor of the car. It’s interesting to note that the first car officially unveiled with the Porsche Taycan’s platform is, uh, not the Taycan, and it’s not clear if Audi’s GT will benefit from the same 800-volt battery architecture and fast-charging as the Porsche, since the E-Tron crossover doesn’t. Bild’s reported acceleration figure of zero to 100 kph in less than four seconds, which could be similar to the Porsche Taycan’s teased performance of zero to 60 mph in around 3.5 seconds, though it would make sense to make the luxurious Audi a bit slower. I guess we’ll find out Wednesday.